In your spa or hot tub, everything is connected. Keeping your water clean is not only beneficial for a pleasant spa experience, but it is also necessary to maintain clean and working pipes and filters. 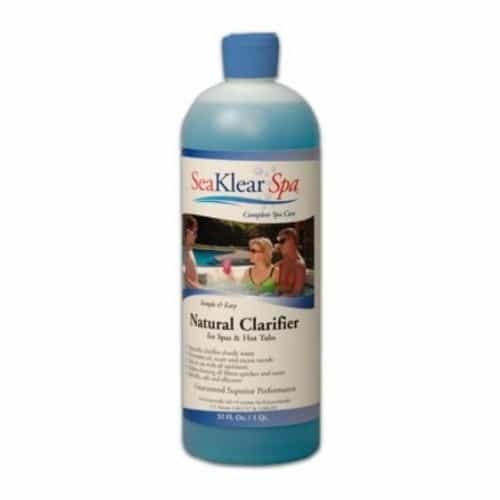 Spa Natural Clarifier by SeaKlear eliminates oil, scum and excess oils from spa water. It is compatible with all sanitizers, and is a trusted spa chemical that has been in use for over 15 years. Spa Natural Clarifier by SeaKlear and HaloSource features a natural and biodegradable formula that is safe on skin, eyes, swimsuits and all spa components. With regular use of the Spa Natural Clarifier, clouds and metal present in the water will disappear and residues of scum and oil will vanish from the walls. And, filter efficiency will improves drastically, and cleaning filters will become a breeze. For standard weekly treatment, use one fluid ounce of Spa Natural Clarifier per every 500 gallons of spa or hot tub water. For bad, cloudy water add two to three ounces of Spa Natural Clarifier to the spa water.